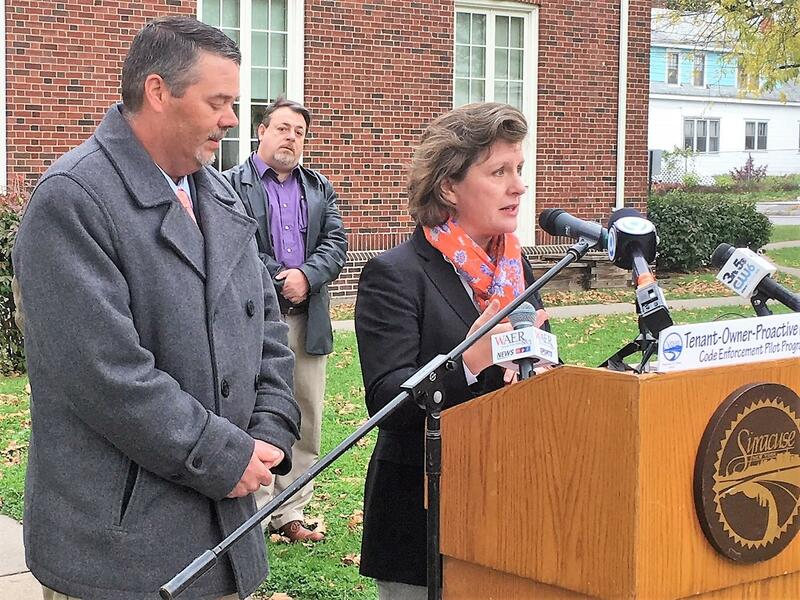 Mayor Stephanie Miner announces the Tenant-Owner Proactive (TOP) Program in front of the White Branch Library on Butternut St. The City of Syracuse is trying a new approach to code enforcement in hopes of solving problems more efficiently. The pilot program is aimed at building relationships between the city, property owners, and tenants to improve compliance. WAER's Scott Willis reports the pilot program is aimed at building relationships between the city, property owners, and tenants. 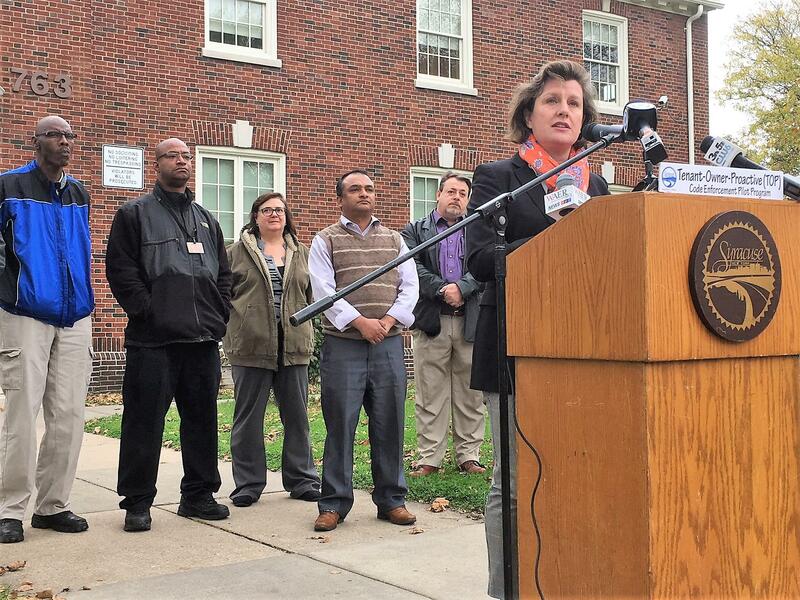 It’s called the Tenant-Owner-Proactive or TOP program, and Mayor Stephanie Miner says it’ll be first tested on the city’s northside for the next six weeks. "Each block is going to receive a scorecard to determine their biggest needs. Inspectors are going to be assigned to a beat where they'll patrol and develop relationships to learn the needs of each of these blocks." 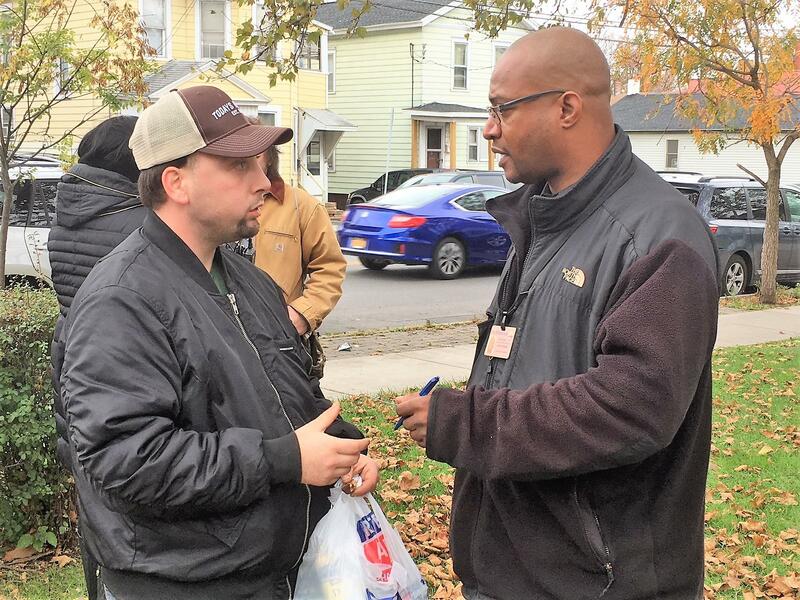 A resident of Oak Street was passing by the press conference and complained about the condition of the home he and his mother rent from a landlord based in New York City. A code enforcement officer took his information and planned to meet at the home a short time later. "...Where there may be bed bugs. Where there may be lead paint. Where water is shut off. Where heat is shut off. Is that related to how many properties are owner occupied. Are there some property owners who've worked with us when we made the first call. Are there others we've traditionally had to sue in court to get them to do the right thing." The mayor says they realized the legal route was not working. "When you look at how many open cases we have that we go to court with every month, and how many have been on the docket for years, is there a better, more efficient way to limit the number of cases we have to go to court with. Can we work with property owners or people who live in those properties to eradicate those problems right away, instead of waiting 6 to 8 months to a year to two years to have a judge say it to a landlord who has to take time to implement that." Code Enforcement Director Ken Towsley joins Miner for the announcement. Miner says this more proactive, data-driven approach should identify the problematic landlords who avoid responsibility. "Right as we're about to lower the boom, they change [their name] from 123 LLC to ABC LLC. There's a lot of cat and mouse we do with our legal department. The more we can focus our legal department on the truly bad actors, as opposed to the people who don't understand how to meet their responsibilities, we think that's a more efficient way to provide services." If the program works, Miner says it’ll be up to the next mayor to use the data collected to determine if the program merits implementation city-wide. Mayor Stephanie Miner reflected on some of the city’s most intractable problems she’s had to confront in her almost 8 years as mayor. Issues such as violence, struggling schools, and poverty were among her largest challenges. Her farewell address covered how such problems were faced and critical obstacles that remain. Residents of Syracuse’s Northside are about to get a soccer field, but they’ll have to wait until next spring. The new fields were unveiled at Schiller Park Tuesday. The space is large enough to hold two youth-sized or one regulation soccer field. The sport has been gaining steam throughout the city, thanks to its popularity among the refugee community. Mayor Stephanie Miner says she realized how important the game is to that community and that it was about time they had a field to play on.